Canada is the second largest country in the world – and its border with the USA is the longest in the world between two countries. It also has the world’s longest coastline – and one of the world’s lowest population densities. Although it’s famous for its Rocky Mountains (and of course it’s Royal Mounted Police, or Mounties) much of the skiing – particularly the heliskiing in Canada for which BC is famous - is on mountain ranges which are not technically in the Rockies at all, but to the west of them. Perhaps surprisingly, skiing in Canada is possible in all 10 of Canada’s provinces. But of course the biggest and best known of Canadian ski resorts are in British Columbia, neighbouring Alberta, and Quebec in the east. Much of BC’s skiing is actually in sub-ranges of the Columbia Mountains like the Monashees, Cariboos, Purcells and Bugaboos. Whistler, Canada’s most famous resort, is in the Coast Range, while Quebec’s mountain’s, like Tremblant, are in the ancient Laurentian range. Some 90 minutes from Vancouver, BC, the Olympic resort of Whistler (including its close neighbour Blackcomb), likes to style itself the most popular resort in all of North America. 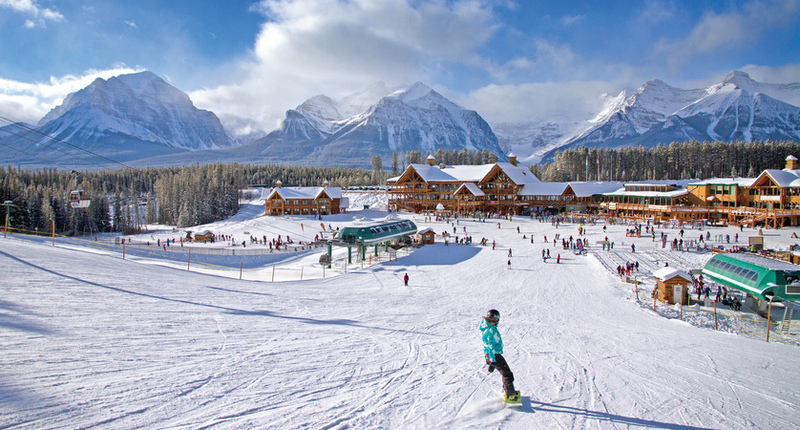 Its biggest rival is Alberta’s Banff-Lake Louise, where the so-called ‘Big 3’ ski areas include Sunshine and Banff’s local ‘hill’, Mt Norquay. In Quebec, Tremblant – like Whistler with Vancouver – can be combined with a city add-on in Montreal. They say comparisons are odious, but how do ski resorts in Canada differ from those in the USA? They don’t hugely, but there are a few differences. Canada’s mountains are in general much more dramatic and Alpine in appearance than those in the American Rockies (the awe-inspiring Bow Valley mountains you see from the upper slopes of Lake Louise are a good example). But this is odd because America’s mountains are generally higher. The reason for this phenomenon is that Canada’s mountains tend to start at a lower altitude, so the vertical drop is often bigger. And looks bigger. Because Denver is already perched almost exactly a mile high at 5,280 feet, many Colorado mountains don’t appear to be as high as their Canadian counterparts. And of course being further north than the USA, good snow conditions are pretty much assured, regardless of altitude.. Resort culture can differ too: for example if a run is marked ‘closed’ in Canada, it’s not quite such a heinous offence to ski it as it is in America, although over the years, the Canadians have tightened up on this procedure. Time was when they simply regarded closure signs as strong guidance - but left skiers and boarders to decide for themselves whether to risk it without fear of being arrested! But these days skiing a closed run will probably get you into almost as much trouble in Canada is it would do in the USA! Apart from having some of the best ski resorts in Canada, such as Fernie and Kimberley, British Columbia is the heliskiing capital of the world. Although Alberta (with excellent resorts such as Lake Louise, Sunshine, Mt Norquay and Jasper’s Marmot Basin) has a number of cat-skiing operations (a little like heliskiing except you’re taken to the untracked powder fields by a snowcat converted for passengers, a rather slower method of uphill transport) all the heliskiing happens in BC – most famously with Canadian Mountain Holidays (CMH) and Mike Wiegele. What Quebecois resorts like Tremblant may lack in vertical feet and powder they make up for in ambience and cuisine. The French Canadians combine American politeness (not always found in France!) with French cooking so that you get the best of both worlds. And a side visit to Montreal – just like Vancouver in BC - is a huge extra attraction. Banff is a lively town set in the spectacularly beautiful Banff National Park. Downtown Banff offers traditional Canadian hospitality with an excellent variety of bars, some with live music, and a wide choice of restaurants catering for all tastes and budgets. 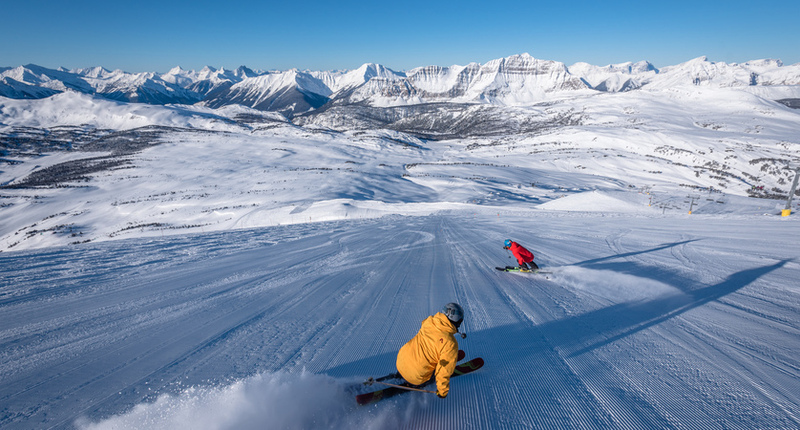 With almost 140 trails and extensive off-piste, Lake Louise has the biggest international cachet of Banff’s “Big 3” resorts (Lake Louise, Sunshine Village and Mt Norquay). Forty minutes from Banff, Lake Louise offers peace and tranquillity in one of the world’s most spectacular ski settings, with unspoilt views of magnificent peaks, glaciers and the iconic lake. Repeatedly voted the ‘Best Resort in Eastern North America’ by the Ski Magazine, Mont Tremblant combines extensive skiing with a wealth of winter sports activities, earning it the title ‘the Disneyland of winter ski’. The charming and colourful village of Tremblant also serves some of the tastiest food of any of our North American ski resorts. This charming and welcoming little resort is a haven for wildlife lovers with skiing in unspoilt surroundings at nearby Marmot Basin in the stunning Jasper National Park. Shimmering glaciers, forests, frozen lakes and waterfalls form the backdrop for a range of activities from dog-sledding to ice canyon walks and wildlife safaris, and Jasper ski area’s uncrowded slopes and dry powder snow are renowned. Fernie has a cult status amongst stronger skiers and snow boarders. It’s celebrated for its steep and deep, and its extensive off piste. So Fernie is one of the best resorts for enthusiastic skiers and snowboarders looking for new peaks to conquer. Kimberley Alpine Resort is located right at the foot of the slopes and offers ski in/ski out accommodation and a variety of skiing terrain in a beautiful setting. As well as its stunning views of the Rockies, lift queues are rare with well groomed runs, making it a great choice for convenience and an ideal place for families and beginner skiers. Montreal is a city unlike any other in Canada. With a distinctive French culture and uncompromising beauty, it radiates a sophisticated glamour rarely encountered in North America. Renowned for its innovative fashion, extensive arts community and delectable bistros, the city is a fully evolved metropolis. Vancouver is consistently rated among the world’s most beautiful cities and winter is a great time to visit. There is so much to see and do and all sites are easily accessible by public transport; just make sure you bring comfortable shoes! Fly from: London Gatwick, London Heathrow, Manchester & most provisional airports via Amsterdam or add ons with British Airways from Birmingham, Glasgow, Edinburgh & Manchester on to Heathrow and then direct to Calgary.